WORLDWIDE: Compressed air energy storage (CAES) for grid-scale electrical energy has a long but somewhat spasmodic history. This article was first published in WindMax, the quarterly technical data publication of Windpower Monthly. Click here to find out more. The first large-scale commercial plant was built in Huntorf in Germany and has now been in successful operation for many years. The reason for the slow progress of CAES is the prohibitive cost of a suitable storage vessel. Large CAES schemes have relied on disused underground caverns to provide a reservoir for the compressed air, but these are not readily available and may not be close to a market for electrical energy. Also, existing CAES plants are not environmentally "green". Compression of air into the storage reservoir generally relies on compressor power generated by fossil fuel, and recovery of stored energy uses conventional gas turbines burning fossil fuel. Even if the compressor power is provided by wind turbines, the plant is predominately fossil fuel-powered. The prospects for CAES could be about to change. 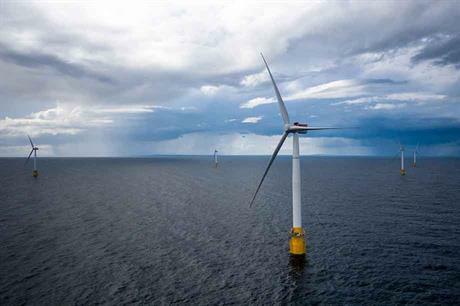 Buoyant supports for offshore wind turbines are of increasing interest. Floating foundations such as the Statoil Hywind type require a substantial buoyancy volume for hydrodynamic stability and this offers an obvious opportunity for storing energy as compressed air. Figure 1 (below) shows the dimensions of an articulated buoyant column sized for a 6MW turbine in 80m water depth. Figure 2 (beneath) shows the buoyant column diameters required to achieve sufficient stability for turbines mounted on such columns as a function of turbine power and water depth. Figure 3 (bottom) shows the total energy that could be theoretically stored in these columns when filled with compressed air at 10 bar. Conventional CAES schemes are based on air at very high pressures of 170 bar or more, but in wind turbine applications such pressures are impractical and not necessary. A storage pressure of as little as 10 bar can provide enough stored energy for a practical system. Such a low pressure should be accommodated with little modification of the turbine buoyancy chamber, which has to be of significant wall thickness to cope with normal transport and operating stresses. In its simplest form, a CAES system for an offshore wind turbine would use a multistage compressor driven from the electrical output of the turbine generator, and a separate expander-driven generator, to feed back the stored energy when there is sufficient demand. It would be impractical on a single turbine to burn fossil fuel to enhance energy recovery in the expander – and would defeat the objective of a totally green system. The expansion of air in unfired turbo expander systems to recover energy has well-known history in air-separation plants, factory air systems and aero engine testbeds, so the technology required is reasonably well established, as it is for the compressor, which would likely be of a standard packaged centrifugal type for which there are a wealth of references. In a single-stage expansion from 10 bar down to atmospheric pressure the expander exhaust temperature would reach cryogenic levels. Energy would be recovered and power would be available from the expander to drive a generator, but without a fossil fuel combustion system the power available would be limited. The power can be substantially increased however, and very low air temperatures avoided, by a variety of methods. In a multi-stage expander, ambient temperature sea water could be used to provide interstage heating of the expanding air and could also preheat the first stage of air as the temperature inside the storage vessel falls due to the declining pressure in the reservoir. This would make use of free heat in the ocean as the energy source for what is in effect a heat pump. Compressing air from atmospheric pressure to 10 bar requires an intercooled multi-stage compressor. The heated water from the compressor intercoolers can be stored in an insulated vessel, and also used, in the energy recovery phase, to preheat the expander inlet air stream, or for interstage heating. The cooling water could be retained in a closed system in which the water is repeatedly cycled to and from hot and cold water storage tanks. To adapt a buoyancy column for CAES would require a machinery room between the column itself and the tower to house the necessary compressor, expander and ancillaries. Strengthening of the end closures of the column would also be necessary. Elimination of the need for a standby oil- or gas-fired turbine generator, plus the opportunity to offer stored energy at a premium price during peak demand would offset the capital costs involved. The performance of a 10-bar CAES system based on a buoyancy column big enough to support a 6MW wind turbine in 80m water depth has been analysed. Such a system having a buoyancy volume of some 15,000m3 would contain a total of 9MWh of stored energy, from which, by operating between the limits of 10 bar and 6 bar, the power available from the expander generator would be about 4.5MW at the start of a one-hour period of recovery, falling to 1.75MW as the reservoir is depleted to the minimum level of 6 bar. Average power during energy recovery mode is then about 3MW, some 50% greater than the average power currently available from a 6MW turbine. The system is entirely flexible and the calculated powers are based on an arbitrary choice of a 10-bar pressure. If more power is required the storage pressure can be increased, or the column diameter increased to give more storage volume; if less power is acceptable the storage pressure could be reduced. The system described above offers a potential solution to the problem of the intermittent and unpredictable nature of wind. Not only does a large buoyant turbine support offer a CAES reservoir of exactly the right size, but the reservoir is located exactly where it is required.